This page provides a brief overview of the Table class implementation, in particular highlighting the internal data storage architecture. This is aimed at developers and/or users who are interested in optimal use of the Table class. Note that this applies to astropy version 1.0 and later. 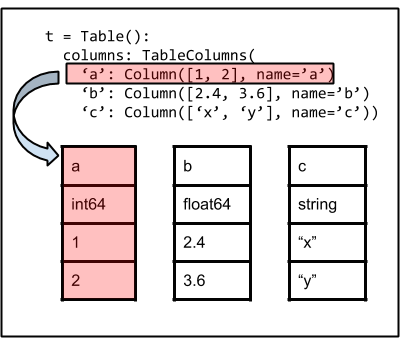 The image below illustrates the basic architecture of the Table class. The fundamental data container is an ordered dictionary of individual column objects maintained as the columns attribute. It is via this container that columns are managed and accessed. Each Column (or MaskedColumn) object is an ndarray subclass and is the sole owner of its data. Maintaining the table as separate columns simplifies table management considerably. It also makes operations like adding or removing columns much faster in comparison to implementations using a numpy structured array container. As shown below, a Row object corresponds to a single row in the table. The Row object does not create a view of the full row at any point. Instead it manages access (e.g. row['a']) dynamically by referencing the appropriate elements of the parent table. In some cases it is desirable to have a static copy of the full row. This is available via the as_void() method, which creates and returns a numpy.void or numpy.ma.mvoid object with a copy of the original data.